COLUMBIA, 7/22/12 (Feature) -- For many people, one of the most frustrating things about Columbia's latest foray into downtown redevelopment is the numbing suspicion that a tragic history is about to repeat. At the center of that history is the Sharp End, an area of black-owned businesses lost to blight decrees, eminent domain, and Federally-funded "urban renewal" that followed the 1949 Federal Housing Act. Records from the era show that City Hall and a Land Clearance for Redevelopment Authority paid less than 50 cents on the dollar to black landowners forced to sell. The land was then re-sold to white-owned businesses. At the time, "slum clearance" was the laudable goal. 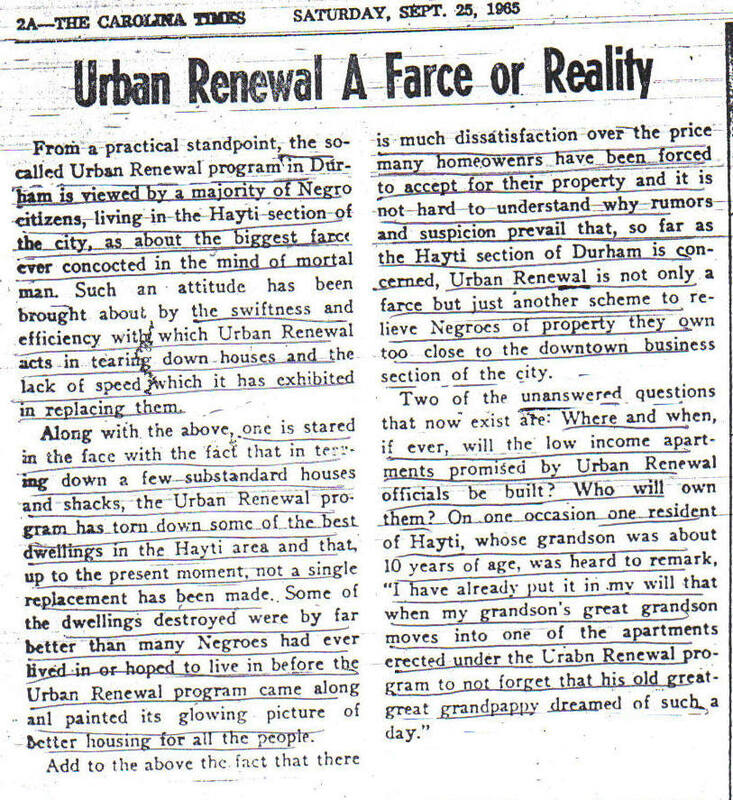 But local bureaucrats cleared more than just slums in cities around the country, as the eye-opening 1965 editorial about the Hayti district in Durham, NC (left,, click to enlarge) explains. Now, with talk of TIFs and EEZs -- tax incentives that rely on blight -- "good jobs" are the goal here in CoMo. As a question mark punctuating the latest talk about how to "make Columbia better," the Sharp End has loomed large in recent months. It's come up again and again in the Blight Decree/EEZ debate. During Almeta Crayton's old-timey style Town Hall at Douglass Park last week, "Remember the Sharp End" resonated in a discussion of the Columbia Housing Authority's own redevelopment plans. Now, there's talk of a coalition of groups asking City Hall for a formal apology over its loss. All the debate and discussion has prompted the Heart Beat to revisit a wonderful well of black history in Columbia, Mizzou geography graduate Jason Jindrich's thesis, Our Black Children: The Evolution of Black Space in Columbia, Missouri. Most of this narrative is directly excerpted from it. Jindrich writes that he began his "research journey through the landscape of early twentieth century Columbia on a bike riding west down Park Avenue." A "just the facts" approach led him to forego interviews with old timers whose memories are influenced by sentiment, instead relying on written records and recorded documents that would recreate black Columbia "forty years after the last of Sharp End disappeared under parking lots and housing projects that still stir controversy." Over 120 pages, Jindrich carefully documents what may be the single greatest economic problem in black Columbia: the broad shift from ownership to renting. The history of the Sharp End is an enduring symbol of that shift. By 1865, Jindrich writes, much of what was to become Sharp End was in the hands of two men of color: Gilbert Akers who owned most of the block bounded by Third, Fourth, Walnut, and Broadway; and John Lang who owned a majority of the next block east. The area occupied what is commonly known as the Flat Branch bottom, where the landscape dipped down to the creek, mostly buried during urban renewal. Sharp End may have developed in the Flat Branch bottom because it was open to black investment after the white community abandoned it for higher ground and better soil. Hard-scrabble freed slaves, their families, and their early successors bought the land and settled it themselves. John Kellogg characterized historic black space in Columbia as "damp, poorly drained lowlands... of very steep slope." It was also composed of a soil type prone to erosion. Overlaying a map of black residence (Elwang, 1904) on a soil survey map (Soil Conservation Service 1962) indicates the majority of Columbia's black population was confined to the region of Keswick soil near Flat Branch Creek where a steep 5-25% slope made building difficult and flooding a continual problem. The land was ultimately abandoned by the white community, Jindrich writes, and Sharp End took root in what would become the heart of the city.